Newly released cover art for Meg. Steve Alten has announced on his Facebook page that an all-new anniversary edition of MEG is being released on Nov. 10th. At nearly 600, pages this paperback combines a completely rewritten and expanded version of MEG with MEG: ORIGINS. This release was originally slated for next summer but has been moved up for undisclosed reasons. Steve is appealing to fans to call their local bookstores, and notify them of the release as they are not expecting it. PLEASE call your local bookstore and have them order copies! Give them this ISBN: 978-1-943957-01-9 You must do this or they’ll order the old version – which is out of print! Back in June, it was announced that Eli Roth has signed on with Warner Brothers to direct a big budget adaption of MEG. While, no release date has been officially announced it is anticipated to hit theaters in 2017 and will reportedly have a budget similar to Jurassic World ($150M). A “trailer” for the book was also released by Steve. 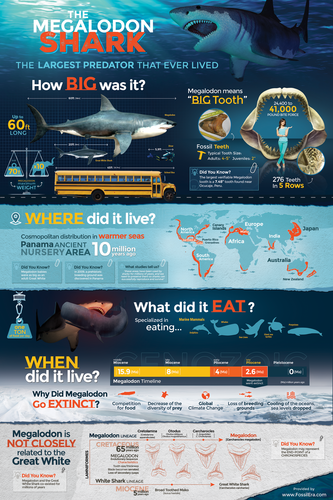 Could The Megalodon Be Alive In The Deep Ocean? Previous What is the largest Megalodon tooth ever found?